We meet on the fourth Friday of each month except July, August and December, 7:30pm in the Hastings Community Hall of the Hastings Community Center. The entrance is located on Pender Street just behind the Gym. The Hastings Club has been active for almost 50 years. 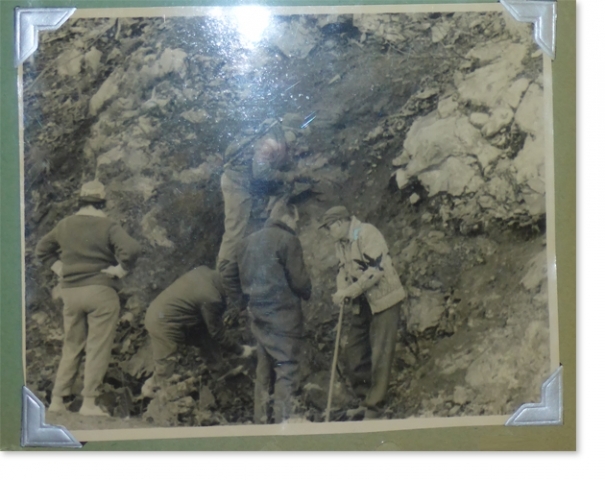 Interests of members range from all aspects of the lapidary arts to rock, mineral and fossil collecting. We have a well equipped workshop where we cut cabochons, facet stones, as well as polish and set jewelry. More than half of our members are accomplished silversmiths and jewelry designers. Some make gem trees, do enameling, carve rocks and wood, or collect minerals as well. We also organize regular field trips to various rock hunting areas. 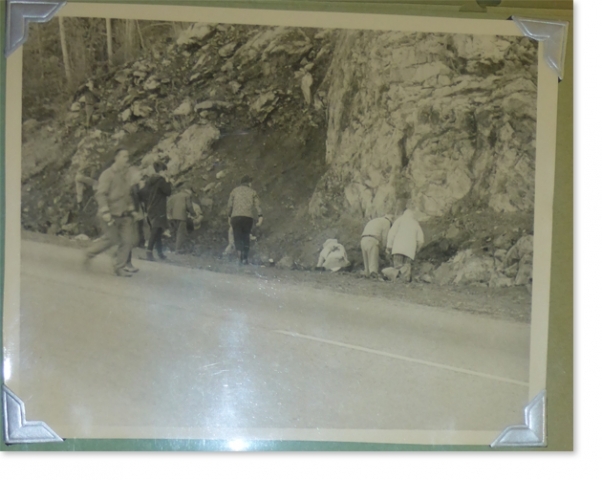 Our club formed in 1958 and within a short time club members were participating in local and BC shows. 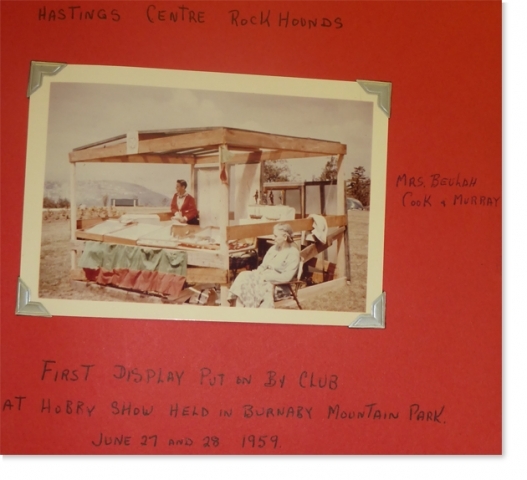 The first display was at a Hobby Show held in Burnaby Mountain Park on June 27 and 28, 1959. It looks like they had pretty good weather, but were prepared for anything. 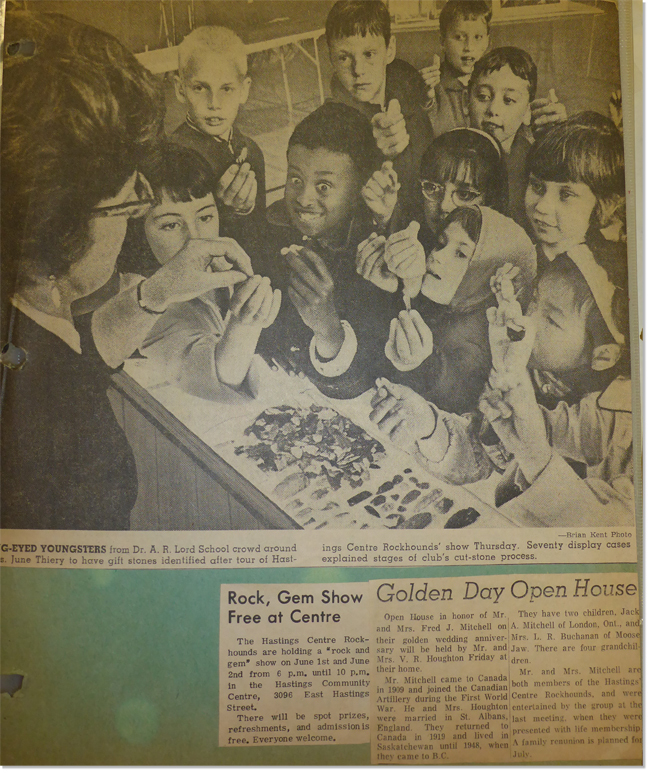 We participated in the BC Gem and Mineral Show every year after that. 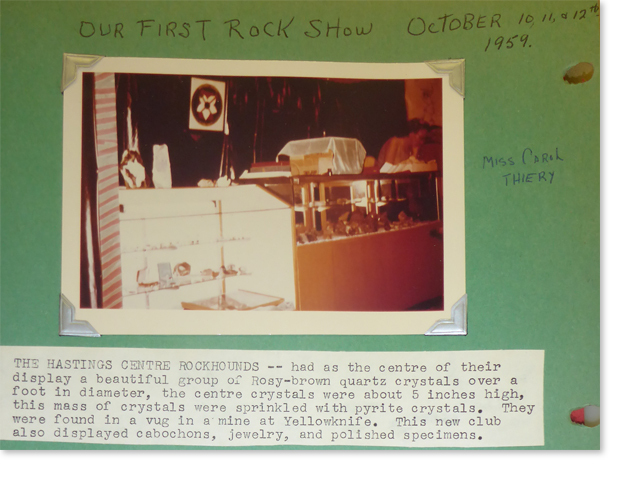 In 1960 the display by Hastings Centre Rockhounds was a log house booth which inside had several cases of crystals and artifacts collected by the members. Today’s displays are not nearly as elaborate and follow specifications for size. 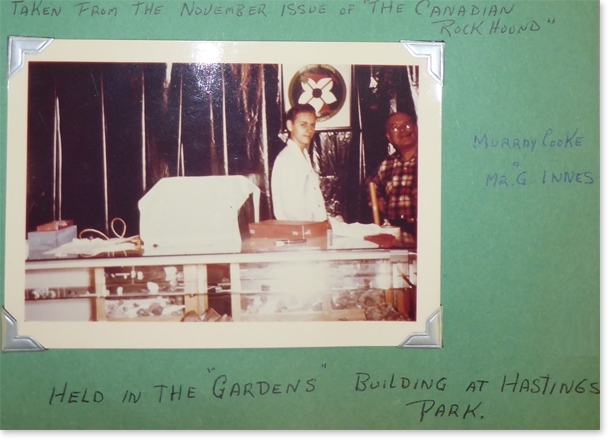 By 1966 we were ready to host our first show at the Hastings Centre. It was reported in the Vancouver Sun with a large photo of students from the local elementary schools holding up gift rocks to be identified after they toured the show. Times do change though… the 1966 show was on Wednesday and Thursday evening from 6pm until 10 pm. (The students must have had a special show time). This year, 2018, our show has daytime hours on the weekend!